About "Relationship between zeros and coefficients of a quadratic polynomial"
"Relationship between zeros and coefficients of a quadratic polynomial" is the stuff which is much required to the students who study high school math . To understand "relationship between zeros and coefficients of a quadratic polynomial", let us consider the quadratic polynomial. Apart from the two relationships between zeros and coefficients of a quadratic polynomial given above, we have some more stuff on it. Let us look in to them. Let the two zeros be equal and opposite in signs. Therefore, if "b = 0", then zeros of the quadratic polynomial will be equal and opposite in signs. Let the two zeros be reciprocal to each other. Therefore, if "c = a", then zeros of the quadratic polynomial will be reciprocal to each other. 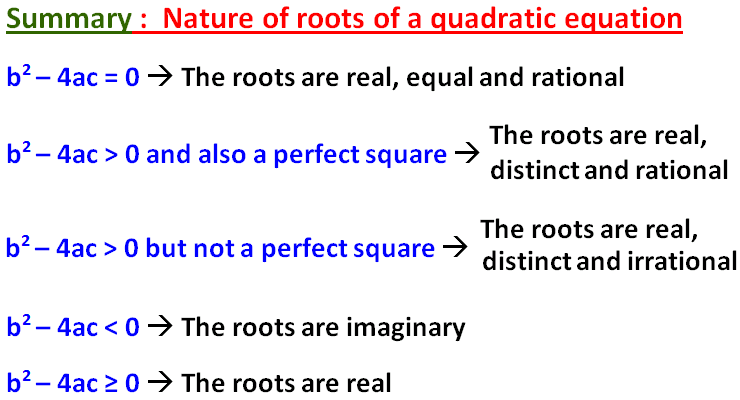 Now we are going look in to an important stuff on "Relationship between zeros and coefficients of a quadratic polynomial"
In this stuff, we are going to see, how to examine the nature of roots of a quadratic equation using the coefficients "a", "b" and "c". 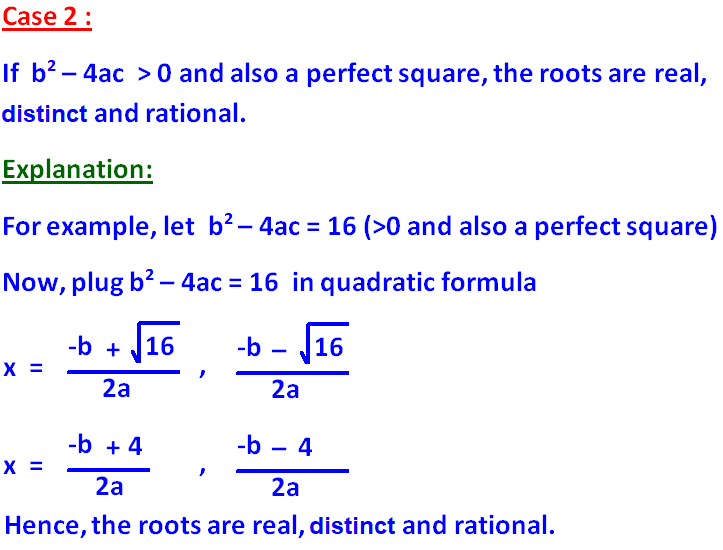 For that, let us consider the quadratic formula which is applied to solve any quadratic equation. So fare we have seen the different types relationship between zeros and coefficients of a quadratic polynomial. Now let us look at some examples on the stuff "Relationship between zeros and coefficients of a quadratic polynomial". To have better understanding on "Relationship between zeros and coefficients of a quadratic polynomial", let us have some example problems. Test, whether the zeros of the given quadratic equation are equal in magnitude and opposite in signs. When we compare the given equation with the general form, we get a = 1, b = 0 and c = 6. 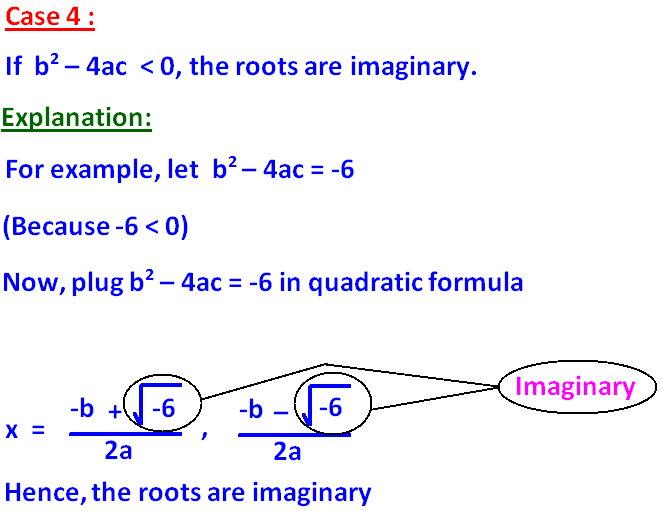 Since b = 0, the zeros of the given quadratic equation are equal in magnitude and opposite in signs. If x² + 3x + 1 =0 is compared to the general form ax² + bx + c =0, we get a = 1, b = 3 and c = 1. Since b ≠ 0, the zeros are not equal in magnitude. 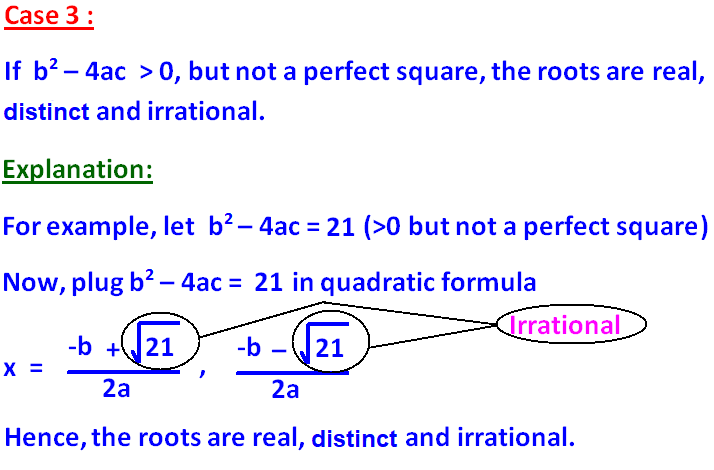 Test, whether the zeros of the given quadratic equation are reciprocal to each other or not. If 5x² - 8x + 5 = 0 is compared to the general form ax² + bx + c =0, we get a = 5, b = -8 and c = 5. Since a = c, the zeros are reciprocal to each other. If 5x² + 7x + 4 = 0 is compared to the general form ax² + bx + c =0, we get a = 5, b = 7 and c = 4. Since a ≠ c, the zeros are not reciprocal to each other. 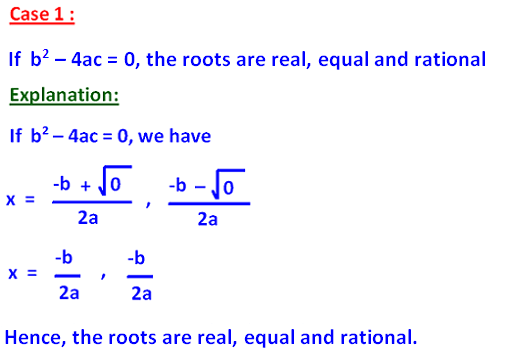 Find the sum and product of the roots of the quadratic equation given. If 2x² + 7x + 5 =0 is compared to the general form ax² + bx + c =0, we get a = 2, b = 7 and c = 5.
we get a = 1, b = 5 and c = 1. After having gone through the stuff and example problems explained above, we hope that the students would have understood "Relationship between zeros and coefficients of a quadratic polynomial"
If you want to know more about "Relationship between zeros and coefficients of a quadratic polynomial", please click here.